MyStaycation Builder is a design tool that is linked to your website that allows your visitors to choose from hundreds of design elements to create the backyard of their dreams from the comfort of their home. This lead information, along with the project design, is sent directly to your sales team via email to help you pre qualify your leads. MyStaycation Builder allows website visitors to choose from hundreds of design elements and go from just dreaming about a pool to picturing it in their own backyard. While they’re having fun designing, MyStaycation Builder is collecting valuable information to pass along to your sales team. These are real time leads delivered directly to your inbox that can be qualified using the information they provide, including their first and last name and email at registration. MyStaycation Builder is an innovative sales tool that engages the consumer in the design process and positions your company as the logical next step. Once the user is registered and is finished designing their project, they will be able to click the “Save Your Work and Forward to Us” button. Drag & Drop. Our easy-to-use interface allows users to drag and drop elements on the design area to build the backyard of their dreams. Over 100 Design Elements. Users can choose from over 100 design elements on all types of materials and features and explore ideas they might have never thought about. Intuitive Control. It’s easy for users to make changes and try new things until they settle on the features and design they want you to include in their new pool design. Save Your Projects. By providing their email and contact information, users can save up to three projects at a time to come back to later. Promote Your Company. The entire process takes place directly on your website and your company’s logo appears on every design. Easily Share to Social. Users can easily share designs across their social networks, giving your company added exposure and inviting others to your website to try the tool for themselves. Get Solid Leads. Convert casual website visitors into solid leads by offering a fun and engaging way for consumers to begin the sales process on their own. Be Prepared. Better equip your sales team with information to offer the right products and services and recognize the right opportunities. Close Faster: Speed up the consultation process by helping customers make big design decisions before they walk into the showroom. More Leads: Never miss a lead by capturing valuable information in real time, 24/7. They design the backyard of their dreams. Spa or backyard retailer company looking to drive more sales. Shasta Pools & Spas knew they would have to do something fresh and innovative to attract customers and maintain their position as a leading pool builder in Phoenix. 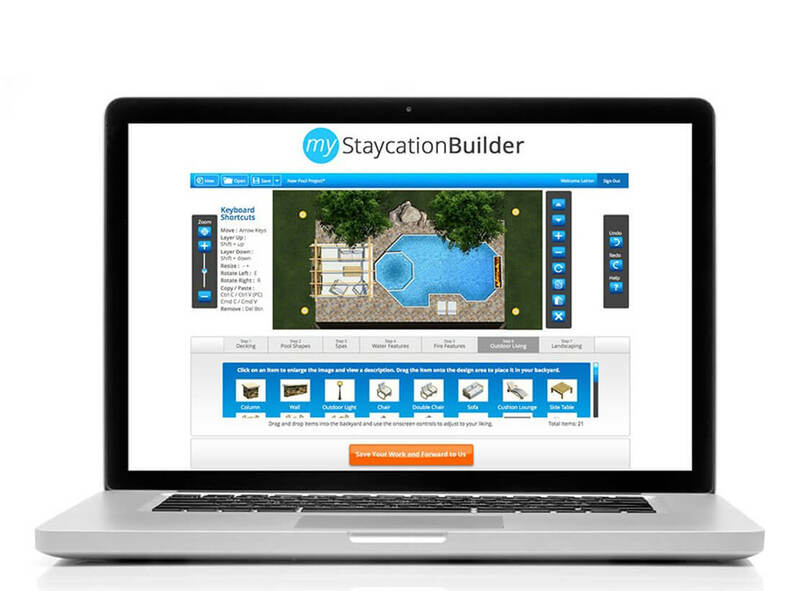 We knew our dynamic and interactive online tool, MyStaycation Builder, was the perfect fit as this interactive tool allows customers to “build” their pool from the comfort of their own home. Since offering MyStaycation Builder to their prospects, Shasta has seen their lead count climb directly as a result, from an extra 435 in 2016 to nearly 1,500 in 2017. They are currently on pace to gain even more leads in 2018.